John Harrison (24 March 1693 – 24 March 1776) was a self-educated English clockmaker. He invented the marine chronometer, a long-sought and critically-needed key piece in solving the problem of accurately establishing the East-West position, or longitude, of a ship at sea, thus revolutionising and extending the possibility of safe long distance sea travel in the Age of Sail. The problem was considered so intractable that the British Parliament offered a prize of £20,000 (comparable to £2.77 million in modern currency) for the solution. 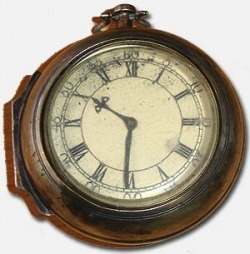 In the episode Time on our hands, in which the trotters find the missing Harrison watch, also known as the lesser watch - and get 6 million at sotheby's, it is all based around a fact. Plans were drawn for the H6 watch and scholars believe that if it was built it would reach that much in a real auction. During the months leading up to Christmas trilogy in 1996, newspapers were predicting how the trotters would become millionaire's with the general consensus being that they won the national lottery, but few would have guessed at the amount of research which had gone into making them becoming millionaires unique and believable.